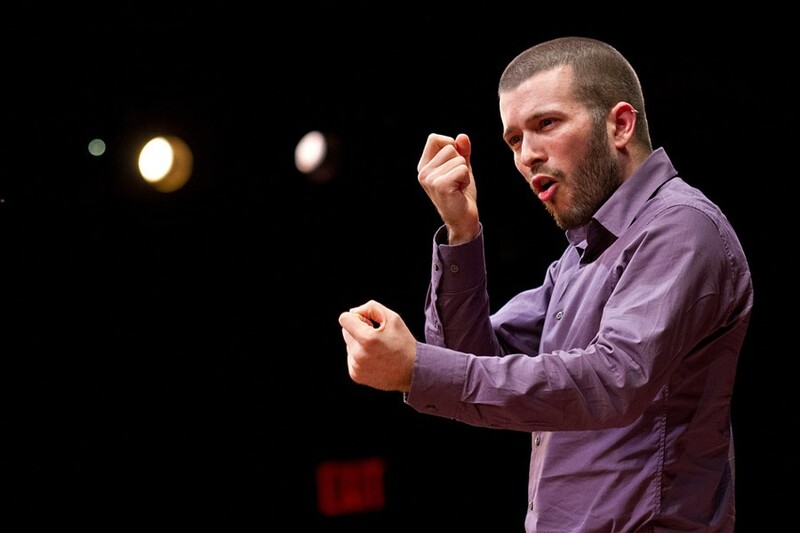 PHOTO BY JEFFREY HAMSON Davin Searls of Discovering Deaf Worlds addresses the TEDxRochester 2012 audience. The nonprofit organization TED began in 1984 as a conference to bring together individuals working in the realms of technology, education, and design, and is devoted to promoting, in its words, "ideas worth spreading." By the end of 2012 TEDx sessions — officially licensed franchised versions of TED — had been held in 1200 cities around the world. Many of the talks have spread like social media wildfires, the more inspiring of them going viral online. Many of the talks serve to challenge our assumptions about what the world needs, or else to jumpstart our apathetic and anxious slumber. The 5th Annual TEDxRochester Talks will be held on Monday, November 4, at the Rochester Museum and Science Center's Strasenburgh Planetarium. In anticipation of the audience application period, we caught up with organizers to discuss previous talks, what they mean for our city, and what Rochester can expect for this year's event. Many people who have been exposed to TED talks will excitedly tell you about their favorites. One of my favorites, by Dr. Marcel Dicke of the Netherlands, offered some of the best arguments I've ever heard for turning from mammals to the abundant insect family to assuage current and future famines. I'm totally convinced by the logically sound case he made, though my anesthetic western training has me utterly unprepared for action on that front. And as an individual, tackling an entire food system seems daunting, impossible. This is where TEDx conferences come in. Individuals may apply to hold independent TED talk events in their own city, which often provide a more local focus. While TED gives a healthy dose of inspiration on an international level, TEDxRochester is a day-long series of short lectures that focuses on what people are trying to accomplish in our city. "Our guideline for ourselves has always been to include speakers who are either from Rochester or have made their impact here," says Tony Karakashian, founder of TEDxRochester. "They live here, they know what the problems are, and they want to effect change," he says. The talks are about creating community, doing what is manageable, and inspiring other communities to do the same. TEDxRochester isn't the only game in town, though at five years it's the most experienced of them. TED doesn't license to a geographical area, says Karakashian; the organization licenses to an individual. TEDxFlourCity held its second event this past spring, and several high schools and colleges have held their own events. "There's more than 12 great ideas every year in Rochester, so there is plenty of room for it," says Karakashian. I found being a part of last year's TEDxRochester audience to be an invigorating experience. The lectures-on-speed were split into two sections divided by a lunch break, and followed by enthusiastic continued discussions during a cocktail/networking hour. Tables in the lobby featured groups such as Rochester Makerspace. Featured speakers included 1975 Gallery director Erich Lehman's talk on defining moments in his life that have pushed him to seize every single day; Davin Searls of Discovering Deaf Worlds, who explained why Rochester is a model community for deaf culture and empowerment; and Rochester Subway's Mike Governale, who remains certain that a shift from car-centric cities is our best bet. Organizing a knowledge-spreading conference was a natural move for Karakashian, who works in information technology, and feels that many workers' unwillingness to share what they know is the result of prizing knowledge as job security. Karakashian explains everything concisely to coworkers, knowing that it will help them communicate technical problems to him. "Knowledge shouldn't be silo-ed," he says. "There are great ideas about how to fix the world, but if nobody hears them, what's the point? TEDx gives a stage to a lot of people who normally wouldn't have a voice, and helps them propel forward." Aprille Roelle Byam, who works in market research and is developing her talents as a storyteller, got involved in the TEDxRochester team this year, and is developing the "superhero backstories" on the TEDxRochester blog, which explain what brought previous speakers to the stage. Byam had grown weary of the corporate world's tendency to approach problems from the same angle again and again, and found inspiration in TED. "This is a whole group of people who kind of look at the world a little tilted, on one foot, and come up with brilliant things because of it," she says. Though the bulk of activity falls between July and early November, organizing the TEDx talks is a year-round duty. Of the 60 to 80 applicants they receive per year, Rochester organizers select 10 to 12 speakers, with a list of bookmarked potential speakers growing every year. The list of speakers for 2013 is just about finalized, and while Rochesterians apply for a spot in the audience, the TEDxRochester team works with speakers to refine their talks, reining them in to a mere 20 minutes, making sure they flow, are to the point, and include a strong call to action if applicable. The team is still ironing out how to best gauge the efficacy of the talks, with regards to speakers moving forward with ideas. Karakashian cites two successes: School 17 Executive Principal Ralph Spezio's 2010 TEDx talk helped launch him nationally in his campaign against lead poisoning. And street-art festival/medical-philanthropy endeavor Wall\Therapy got a boost from their participation in TEDxRochester two years in a row. Organizers are working with Butler/Till Media Services on a program called TEDxRochester365, to continue conversation after the event, and plan to host a social network on the TEDxRochester website where speakers and audience members can connect. The speakers are only one half of the focus of holding a TEDx event — the audience is the other half. TEDx Rochester's audience application period is open now, and will run through the first week of October. The goal is to "get people talking, and realizing that those differences we talk about so often really aren't as big as they may think," says Byam. "And also to kick people in the pants a little bit. You can do something here," she says. TEDxRochester regularly receives about 1200 applicants, of which a small fraction are selected to attend due to the focused nature of the event. The application includes questions about your occupation, passions, achievements, and your favorite websites, in an effort to gauge what you're about. "We want people to be actively engaged," says Karakashian. "The day is not only about the talks, it's about the networking, and the meeting of new people. The ideas aren't just coming from the stage," he says. Organizers try to balance the audience with people who are able to fund projects and people who can volunteer to help them come to fruition. The majority of the line-up of speakers won't be released until after the audience application period is closed, but the organizers have confirmed a few details. The theme of this year's TEDxRochester talks is "Changing Perspectives," with an optimistic, diverse approach to answering the issues facing our city. The event will include speakers with different viewpoints on the way the world works, including those who adopt an historical perspective, like architect Howard Decker. "His talk is on the Rochester of 1912," says Karakashian, "and how at the time, we had everything we needed here to be successful, and we were successful, but we've lost a lot of that." The driving question is whether we can derive answers to our current problems by looking at successes from the past, including densifying downtown. Also confirmed in this year's lineup are activist-artists and professors Heather Layton and Brian Bailey, whose collaborative work has asked viewers to more closely consider the experience of humans and communities that America is aggressive toward, including the Middle East and rough neighborhoods in Rochester. If you apply but aren't selected to attend this year, you can still watch a live stream of the event at tedxrochester.org, where you can also find TEDxRochester's past talks. City Newspaper will follow up on TEDxRochester 2013 with a post-event blog at rochestercitynewspaper.com.